Natural product. Permanently removes tough odors on pets, in home or car. See our full line of pet & home solutions at: www.naturalchemistry.com. Skunks Etc. 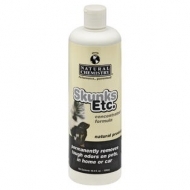 is concentrated and specifically formulated to effectively eliminate odors caused by skunks. This natural product is unconditionally guaranteed and removes the toughest odors permanently. Eliminates all strong odors permanently. For use on pets, carpet, upholstery and in the car. Biodegradable natural ingredients. Also effective on horses and other large animals.